Moving from overseas back to the US, we knew we were in for more than just reverse culture shock. For the better part of ten years – the entire time we knew each other – my husband and I were apart about fifty percent of the time. It something military couples and families know all too well. Whether it be TAD assignments or work ups or deployments, he was gone a lot. It was our “normal” and I lovingly referred to it as functionally dysfunctional. In the course of our constant and dizzying cycles of separation and reintegration, we found a way to adapt and stay the course in our marriage and family life. But it wasn’t the “normal” we wanted. As we moved back to the US, my husband prepared to start working a regular nine to fiver in a non-deployable unit. Work wouldn’t spill into the evenings or weekends like it did in the past. He wouldn’t deploy or travel much for work. He’d be home. We were in for the shock of our relationship. Through the funny, weird and totally unexpected things that came our way when we started spending a whole LOT more time together, we learned some life lessons. 1. Popping home for lunch becomes a thing. And…it’ll throw off your whole routine. I almost got scared a couple of times that a stranger had walked into the house uninvited. Nope. Just my husband popping home for lunch. Never in ten years had he come home for lunch. This threw the kids for a huge tailspin. They were so excited that dad was home for work, followed by disappointment when he had to return to work. After the kids were in school and the kitchen was my office, he’d come home for lunch and start cooking bacon. 2. You’ll start to fight about things you never fought about before. We never fought about dishes sitting in the sink EVER for 10 years. Now suddenly we were fighting over little things. It’s incredible how everyday life sways you into fighting over little things. 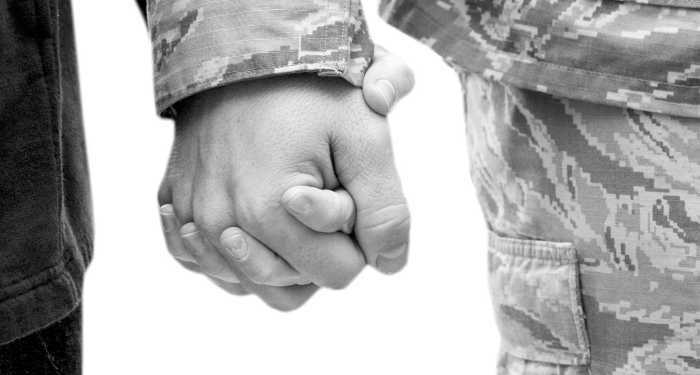 I am surprised to say this, but deployment gives you an appreciation and respect for togetherness that we often skipped the small fights knowing they weren’t important. After enough time together, you’ll find any little thing to pick at. 3. Everything feels lighter and less stressful. Even fights over the dishes. Running a household with two grown-ups around all the time – what’s that?! You start to tag team kids and dishes and laundry and vacation planning. Your partner is around all the time and you’re actually functioning as a team. This. Is. Amazing. You talk about stuff when it comes up, rather than waiting for that next phone call, Skype or email. Thing don’t fester like they did before. Hallelujah. 4. You fall into routines. Then weird stuff starts happening like you plan on drinking coffee for three hours together on a Saturday morning, and when it doesn’t happen, the world is on tilt. You start watching TV shows together, and without even asking, you know what show you’re watching Monday night. You cook, he cleans up. You take the car for an oil change, he picks up dry-cleaning. It’s this weird flow that starts to show up without saying a word to one another. 5. Short separations start to throw you for a loop. 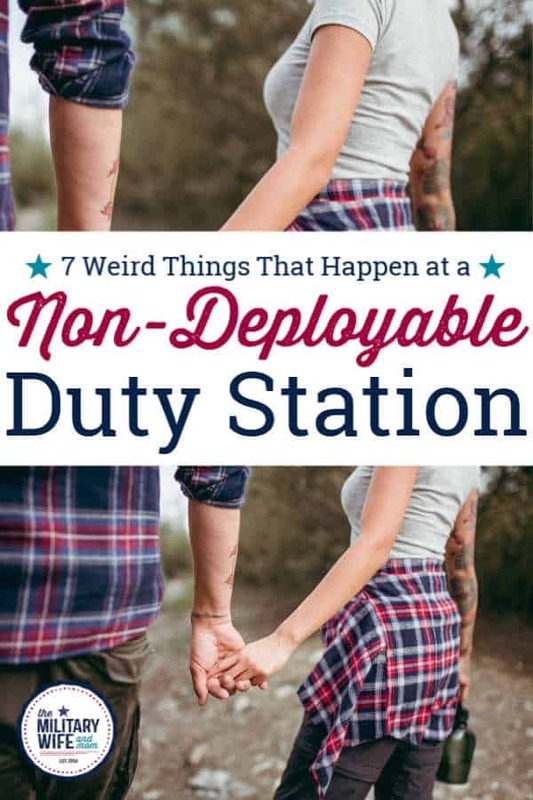 The sting of deployment fades, and you get used to being around each other all the time. Even short separations bring anxiety, when in the past you’d tuck that away for something bigger. Or maybe you were just numb back then without realizing it. 6. You’ll get a little worried thinking about the next time he’ll leave. It’s almost like forgetting to exercise a separation muscle. You’re together a good amount of time, and a long future separation that looms in the future – it stings already. Your family is used to this idea of taking vacations together, spending Friday nights out to dinner and holidays – eat your heart out. It’s so good! Your heart drops into your stomach thinking about how hard it will be next time he leaves. 7. You realize how bad you were just “holding it together” in the past. Functionally dysfunctional – that’s what it was. A beautiful functionally dysfunctional mess, and now that you have a second to breathe, you realize you weren’t as happy as you thought you were. The contrast — it’s palpable.